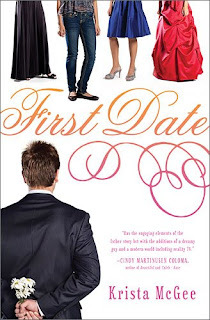 First date reminded me so much of Meg Cabot's All American girl. Hot president's son. Check. Stubborn girl, check. I really wanted to like it as much as I like All American girl but unfortunately I was disappointed. The story had so much potential, the plot and settings could have resulted in many awkward and butterfly fluttering moments but I felt like the author focused too much on religion. Yea, that's the theme that overtook in this novel. I actually do not mind reading about books with religion infused in them, but this book was super saturated with religious talk. It was too much for me especially since Christianity is not my religion. I thought I was getting into a cute read, and while it was in the end, I ended up skipping many pages of religion talk. However I really liked how the president's son and our protagonist's friendship and romance bloomed. I however wished the author put more scenes with them. Overall this book was cute, but a little heavy on the religion. So I would recommend it to anyone who doesn't mind religious themes in their books. This definitely doesn't sound like a book I'd enjoy. I'm not into being force fed religion in books. I'll make sure to stay away from this one. Wow I had no clue this book was so much like American Girl, which I loved btw. I don't mind "inspirational" books but I don't like it when they get religion specific and talk about specific beliefs etc. I thought this one sounded cute but I think I'll pass on it. Thanks for the review! Eek. I'm not sure I would like this with all the religious stuff in it. O_o. Premise sounded really cute though. Thanks for the honest review! No I am not a big religious reader especially when they sneak it in!